Downy, toothed leaves. Small blue or lavender flower heads, grouped in large clusters, during summer and autumn. Several cultivars available, including dwarf forms suitable as bedding plants, and pink or white-flowering forms. Often grown as an annual plant. Prefers a sunny position in well-draining soil. Can survive medium frosts, but will get above-ground frost damage. Cut back to ground-level after flowering. Very easy to propagate from cuttings. Gorgeous blue, fluffy flowers that last well on water. If you would like to be able to pick the flowers, then make sure not to plant a dwarf form. Combine with other blue/purple flowering plants and a touch of orange. Fast growing ground cover, forming a dense, evergreen carpet, and flowering freely during early spring. 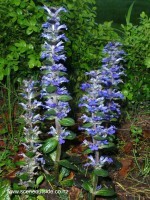 Larger leafed and faster spreading cultivar of Ajuga reptans, which is native to Europe, and commonly known as bugle, bugleweed, bugleherb and carpetweed. Glossy, crinkly, rounded, dark green leaves, tinged with bronze-purple. Deep blue flowers arranged in spikes up to 30 cm long. Growth habit is similar to strawberry plants in that it spreads with runners that form new rooted plants at various distances from the mother plant. Vigorous spreader, but easily controlled in garden settings. Prefers a position in partial shade in any well-drained soil, but can also be planted in full shade or sun. Frost hardy. No maintenance required other than keeping the plant from spreading to areas where you don't want it. Easily propagated by removing rooted portions of the runners from the mother plant and replanting these elsewhere. Excellent choice for covering the ground in shady areas or under trees. The blue flowers look particularly attractive when combined with light green foliage plants. Good edging plant, and lovely addition to rock gardens. Suitable for containers as long as they are watered regularly. Herbaceous perennial, flowering in late summer and autumn with white, pink or rosy pink flowers with golden yellow stamens in the centre, 5-7 cm across. Cultivars vary somewhat in growth habit, but they usually form a clump and spread by means of rhizomes. The mid green leaves are palmately lobed with toothed margins. 'Honorine Jobert' is a popular white-flowering cultivar. Anemone x hybrida is the name given to a group of hybrids of uncertain parentage. They are sometimes sold as cultivars of Anemone japonica. Prefers a sheltered, partially shady position in well-draining soil, enriched with organic matter. May become quite vigorous when given an ideal spot, spreading underground. Water during hot spells in summer to help with establishment. Once established, Anemone x hybrida cultivars are reasonably tolerant of dry conditions. Hot summer sunlight tends to burn the foliage. Cut back after flowering and cover with mulch or straw if severe frosts (below -20 degC) are expected, or leave frost-blackened foliage to protect the plant from further frost damage. Generally free from pests and diseases. Propagate by means of division in spring. Delightful perennial for a semi-shaded position in a woodland garden, cottage garden, or combined with clipped plants to introduce an informal aspect to formal gardens. A variety belonging to the Federation daisies, a group of Australian-bred Marguerite daisies. Flowering with typical daisy flowers, carmine pink initially, and then gradually fading to a pale yellow. Flowers for a long time from autumn through to summer. Prefers well-draining soil and a sunny spot, but will tolerate a partially shaded site. Requires frost protection when young. Once established, Argyranthemum frutescens 'Double Act' tolerates light frosts. Suitable for coastal areas as long as there is some shelter from very strong winds. Lightly prune after flowering to keep the plant compact. Apply a general garden fertiliser in spring. Generally pest and disease free. A wonderful, cheery and carefree plant that is completely smothered with flowers for an incredibly long time, including winter. I love the two tones of pink and yellow occurring on one plant. Suitable for cut flowers but the flower stems are relatively short and lend themselves better for posies rather than large bouquets. Tufted evergreen fern with arching glossy green fronds. Over time fronds can grow up to 1.5 m long, but Asplenium oblongifolium is slow growing and remains much smaller for a long time. Slightly toothed leaflets to 15 cm long. Endemic to New Zealand. Occurs naturally in coastal and lower montane areas in the North Island and parts of the South Island of New Zealand. Performs best in dry shade, and as such is perfect for areas under established trees. Tolerates full sun, but fronds are shorter and paler green. Wet intolerant. Clump-forming, spring flowering, herbaceous perennial, mainly grown for its attractive basal foliage. Slowly spreading by creeping rhizomes. Large, heart-shaped, silvery white leaves with green veins and margins. Small, light blue, forget-me-not-like flowers, held above the foliage on 20-50 cm long stalks. Foliage is evergreen in mild climates, but in colder regions, the leaves die back from late autumn. Ideal for a position where it receives morning sun and afternoon shade, but will also grow in full shade. Brunnera macrophylla 'Jack Frost' handles more sun than most other variegated brunneras, but in regions with hot summers, leaves may be scorched by afternoon sun. Prefers consistently moist, but well-draining, rich soils, and is not tolerant of dry conditions. Frost-hardy. For a tidy appearance, remove old or damaged leaves if present, just before the new foliage appears. Self-seeds, but seedlings may turn out different from the parent plant, and may even have lost the silvery leaf colour variegation. Can be divided in spring or autumn. Excellent choice for the woodland garden. Lovely companion for other shade-loving plants such as hostas and ferns, for spring-flowering bulbs, or for dark-leafed plants such as black mondo grass (Ophiopogon planiscapus 'Nigrescens'. Good ground-covering and edging plant. Herbaceous perennial in the daisy family (Asteraceae) with hairy, oblong to lanceolate leaves (5-15 cm long). In favourable growing conditions, Calendula officinalis flowers for most of the year (except in the heat of summer in warm areas) with pale yellow to bright orange flower heads (4-8 cm across). Depending on the cultivar, the flower-heads may have a definite centre (where the outer ray-florets are absent in the centre of the flower head) or they may be 'double' (where central disc florets are absent). The flowers are edible and petals (ray florets) can be added to salads and other dishes as garnish. Dried petals are sometimes treated as a substitute for saffron. The flowers also have various medicinal applications, and are used in dyes and cosmetics. Calendula officinalis is very easy to grow from seed in a sunny or partially shaded position. Sow in spring in pots or directly in the garden. Any soil is suitable as long as it doesn't get waterlogged. Flowering can be prolonged by removing dead flower heads. Water during dry spells, but avoid spilling water on the leaves to prevent mildew. In mild climates, Calendula officinalis persists in the garden, but it does not survive the frosts in colder climates. In areas with extreme heat during summer, it also behaves as an annual, but since it self-seeds readily, even in such climates, Calendula officinalis usually becomes a permanent garden addition. Remove spent flower-heads before they go to seed if you are trying to confine them to a specific part of your garden. Calendula officinalis is one of the most rewarding plants if you like bright colours. They flower for a very long time and multiply easily unless you deadhead them before they get a chance. They also make good cut flowers in particular the cultivars with long stems, lasting about a week on water. Clump forming tussock grass with weeping green leaves. Gracefully arching flower stems with drooping, silky, pale green plumes, turning a cream colour with maturity. The first flowers appear in late spring and may remain on the plant until the next season. Often referred to as a miniature toetoe. Occurs naturally in localised areas along the east coast of the North Island of New Zealand. Hardy to -12oC. Looks great in combination with flaxes and Muehlenbeckia astonii. In warm and humid areas Chionochloa flavicans is prone to Phytophtera, so will need to be planted in dry or free-draining soil. Clump-forming, evergreen, rhizomatous perennial, native to South Africa. Strap-shaped, shiny dark green leaves, 0.6-1 m long and 5-8 cm wide. Long-stalked umbels of 10-20 or more brilliant orange, trumpet-shaped flowers during early spring, and sporadically at other times of the year. Flowers are followed by berries containing up to 20 seeds, but usually less than 10. Several cultivars are available, including bright yellow, creamy yellow, pale orange, red-orange forms. All parts are poisonous. Prefers a sheltered spot in full or dappled shade and well-draining soil. Avoid a position in bright sunlight to prevent damage to the leaves. Water only in dry weather during the warmer months of the year, but keep dry during winter. Tolerates light frosts only. Easy to propagate by means of division. Excellent plant for a position under the eaves on the shady side of the house. Bold and bright flower display when planted en masse. Flowers last well on water. Foliage is attractive all year round and has good strong, textural qualities, perfect for gardens with a (sub)tropical theme or for combinations with finer-leafed plants, such as ferns. Suitable for containers, either as an indoor or outdoor plant. Herbaceous perennial with narrow strap-shaped leaves, flowering in autumn with lilac crocus-like flowers (5-8 cm wide). The leaves appear in spring and die down before the flowers emerge. All parts are poisonous on ingestion and contact with the skin may cause irritations. Originally from Central and South-East Europe, Colchicum autumnale is naturalised in many countries, including New Zealand. Although the flowers look very similar to those of the Crocus, Colchicum autumnale and Crocus belong to different plant families and are only distantly related in a genetic sense. Apart from a difference in flowering time, you can also tell them apart by the fact that a crocus has three stamens and an autumn crocus has six. Prefers a sunny, sheltered position in well-draining soil. Poor drainage may result in corm rot. In hot climates, partial shade is best. Can be propagated by dividing the corms when they are dormant during winter. Frost hardy (zones 5-9). Lovely for flower display in woodland gardens or in containers. When selecting a spot, consider the fact that the leaves will turn yellow and die in summer, so you may not wish to give it the prime position in your garden, but one to give you a sweet surprise when walking past in autumn. The flower stems tend to be somewhat floppy, and possibly surrounding ground-covering plants could offer support. Evergreen, trailing ground-covering plant belonging to the morning glory family (Convolvulaceae), native to North Africa, Spain, and Italy. Funnel-shaped blue to mauve flowers, 2.5 cm wide, appearing mainly during summer and early autumn. Flowers open and close in relation to the amount of sunlight they receive. Soft, fine-haired grey-green leaves, 1.5-3.5 cm long. Prefers a sunny position in any well-draining soil. Drought tolerant once established. Tolerates moderate frosts (zones 8-10). Trim in late winter to prevent the plant from becoming too woody. Suitable for coastal areas. Undemanding, easy care plant that flowers profusely in summer. Looks great, trailing over walls. Not invasive (unlike the common morning glory). 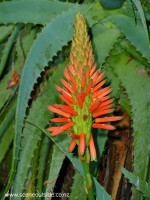 Tall growing, annual plant with delicate, finely divided foliage. Native to Mexico and southern USA, but naturalised in many parts of the world. Summer flowering with white, pink, or crimson, daisy-like, 8 cm wide flowers with a yellow centre. Attracts butterflies. Many cultivars have been introduced, including dwarf ones (Sonata series) that grow 30-50 cm tall. Cosmos bipinnatus prefers a sunny position in well-draining soil. Self-seeds and easy to propagate from seed. Pinch out the tip once the plant is about 15-20 cm tall, to encourage branching. When it reaches flowering size, the plant usually becomes somewhat top-heavy, so will need staking. Deadhead to prolong the flowering season. May suffer from grey mould, aphids, and slugs. Cosmos is an annual plant, so it flowers, seeds set, and then dies within one year. Once you have planted this in your garden, new seedlings will appear in subsequent years (as long as you give the plants a chance to form seeds before cutting off the spent flowers). Lovely flowering plant for the middle or back of borders. Flowers last a bit more than a week on water.